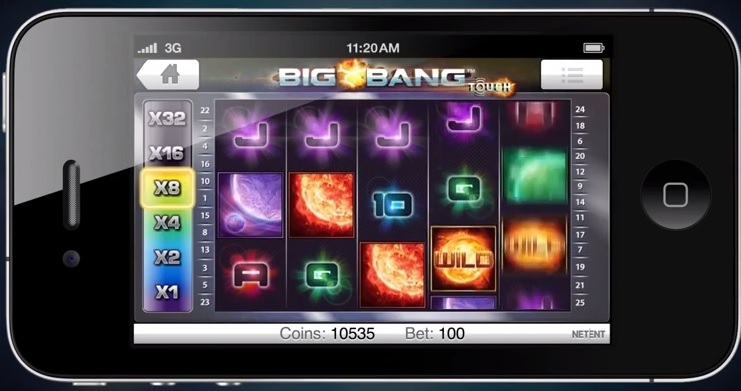 Big Bang, the NetEnt slot game that was released in February, is now available as Big Bang Touch. Touch is the mobile version of all NetEnt games. Most NetEnt casinos, that offer a mobile casino, will have Big Bang Touch by now. Big Bang is a 25 line slot game with an increasing multiplier. Every time you get a winning combination the multiplier is doubled for the next spin. To a maximum of 32 times your win. The multiplier is reset when you don’t have a winning combination. This game can pay out some huge prizes when you are on the higher multipliers.